Jill Henshaw (nee Newlands) is an interpreter from Derby who qualified in 2009 after completing a PGDip with SLI. She has worked in a range of domains, as a freelance interpreter, including: Higher Education, Further Education, Medical, Mental Health and Employment. Recently Jill started working full-time for Nottinghamshire Deaf Society, as an interpreter, in a well-established team of community interpreters. In addition to working as an interpreter, Jill has worked as a CSW, a trainer of Communication Support Workers, and taught a variety of CPD workshops for CSWs and Trainee Interpreters. 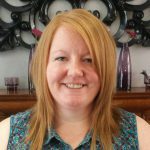 Jill also works as a language support tutor for deaf learners, and as a consultant to examination bodies.